Can several machines be connected to the same compressor? What kind of service is needed? Can I install machines myself? Can I service machines myself? What is reliability of the cylinders? Are your machines intended for muscle toning or for strength training? What is the difference between hydraulic and pneumatic machines? What about the durability of pneumatic machines compared to weight stack equipment? How do I install HUR Balance Software? The program says platform is not connected. What do I do next? How do I install the platform drivers? The program gives error “Library routine called out of sequence” or “table does not exist or is corrupted”. What should I do? How do I change a folder's user rights? How do I export the test results? How do I print the reports as PDF? How do I move a database to another computer? How can multiple users access the same database and records? How do i perform a test in iBalance SmartTouch? 1. What is a compressor? The compressor is basically an air pump, which takes air and pumps it into a small tank. When increasing pressure more air is crammed into the same tank. This compressed air is used to power HUR machines. When you press the + (plus) button a valve opens and air flows from the compressor tank into machine. Pressing the - (minus) button air is freed out of the machine and resistance is reduced. The amount of resistance depends on how much air is added to machine. 2. Can several machines be connected to the same compressor? Yes. However, the number of machines connected to the same compressor depends on the usage of machines. We recommend different kind of compressors depending on that usage. 3. What kind of service is needed? Machines themselves need very little service. We recommend to wipe the upholstery once a day. This is also a comfort issue. If you have an old model of compressor you also need to empty the compressor tank once a week. This is because air humidity causes water condensation in the tank. On newer compressor models emptying is done automatically into a plastic bottle and you only have to empty the bottle as it fills up. We also recommend that you lubricate the cylinders once a year. This can be done without tools in a few minutes. 4. Can I install machines myself? In most cases Yes. There are a few things to take care of, though. As the machines work on air pressure they must be connected to a compressor. Several machines can be connected to the same compressor and a small tube does this. You install a main tube, usually along the wall, and at each machine you attach a T connector to the line. All connectors are "push in" so they will automatically attach to tube. The only thing you need to do is to cut the tube at the appropriate positions. You should also take care of not to get sand, dirt or foreign particles into the network as these might damage valves. This can easily be taken care of by turning on the compressor once before you connect the machines to the network. Turning on the compressor will blow the network clean from any foreign particles. 5. Can I service machines myself? Yes. One of the key design criteria on HUR machines has been to make service as simple as possible. There is not much service needed. Normal maintenance includes wiping the upholstery and lubricating the piston rods of the cylinders once a year. This can be done without tools. 6. What can go wrong? Actually very little. HUR machines have no wires, cams or cables. All moving joints are with ball bearings. Cushion rollers have been lubricated upon leaving the factory, but in a few years in dry air they might dry out and start squeaking. The remedy is to lubricate them. 7. What is reliability of the cylinders? We actually don't know. The first machines that we made in 1989 are still in daily use. The resistance cylinders we use have been tested for 10 million cycles without any signs of wear or tear. These are all industrial grade heavy duty components which are made to last for years in harsh conditions. Fitness usage is after all a rather light and easy environment. 8. Where can I get spare parts? Naturally from us directly or from your nearest HUR dealer. However, HUR machines use only industrial standard valves and cylinders, so you can practically get replacement parts from any pneumatic supplier. If in some distant future your HUR machine breaks down and you cannot reach us, bring the damaged part to the nearest pneumatic shop. They will definitely be able to find you a similar replacement. HUR is also the only supplier of pneumatic exercise machines to use only standard components. This might be more expensive but it guarantees the availability of reasonably priced spare parts anywhere in the world for the foreseeable future. 9. What is Natural Transmission? Natural Transmission resistance mechanism is a system that was developed at the University of Technology in Helsinki in the 1980s. Simply put, Natural Transmission replaces all cams and cables of exercise machines with a transmission system that mimics the muscle function itself. This has 2 benefits. First, it gets closer to how a muscle actually works which means a higher training effect, and secondly, it also increases reliability. In Natural Transmission all moving joints are with ball bearings. This means that wires and cables, which are the items most likely to break down on weight stack machines, have been totally eliminated. 10. Are your machines intended for muscle toning or for strength training? Both. It is up to you! The unique feature of HUR machines is that you can increase the velocity in order to burn more energy. If you like to tone your muscles, simply use low workloads and fast movements. Whereas for building muscle size you use higher resistance, slower velocity and fewer repetitions. 11. What is the difference between hydraulic and pneumatic machines? The difference is that hydraulic machines use oil and pneumatic machines use air pressure. In addition to this there are fundamental differences from a biomechanical and physiological point of view. Hydraulic machines only work concentrically and have no eccentric resistance. They always only restrict the movement whereas in nature the muscles always work both ways. In nature you lift a weight concentrically and you lower it down eccentrically. The case of hydraulic machines is akin to first lifting a weight up and then pushing it down: there is no resistance like that in nature. Pneumatic machines have both concentric and eccentric resistance. 12. What is inertia ? Inertia is a term used in physics to describe movement energy. If you like to lift a weight you need to exert the same force as the force of gravity acting on the weight. However, this is not enough. You also have to apply an additional force to get the weight moving. When you want to stop the weight a force in the opposite direction is required to slow the weight down. Inertia is the force, which opposes a change of movement velocity. Things like to remain the way they are. You need forces both to accelerate things and to slow things down. These forces are inertia. In a training context these inertial forces also cause the resistance curves of weight stack machines to change depending on the way the movements is performed. There is always an additional force required in order to accelerate the weights, which makes the resistance heavier at the beginning of the movement, and at the end of the movement the same inertial effects make the movement lighter. As a result the resistance curves of weight stack machines can never really accommodate to the force curves of the muscles since they change depending on how the movements are performed. 13. What about the durability of pneumatic machines compared to weight stack equipment? 14. How do I install the Balance Software? 15. The program says platform is not connected. What do I do next? Check that the platform’s USB-cable is connected and that the drivers are installed. 16. How do I install the platform drivers? Make sure the platform is connected properly. and unzip to a folder (for example the Desktop) on your computer. Go to Device Manager in Windows. The Hur Platform device should be available if connected. If there is a yellow exclamation mark on top of the device then right-click it and choose “update driver”. After that choose “Browse my computer for driver software” and locate the folder where you unzipped the drivers. 17. The program gives error “Library routine called out of sequence” or “table does not exist or is corrupted”. What should I do? 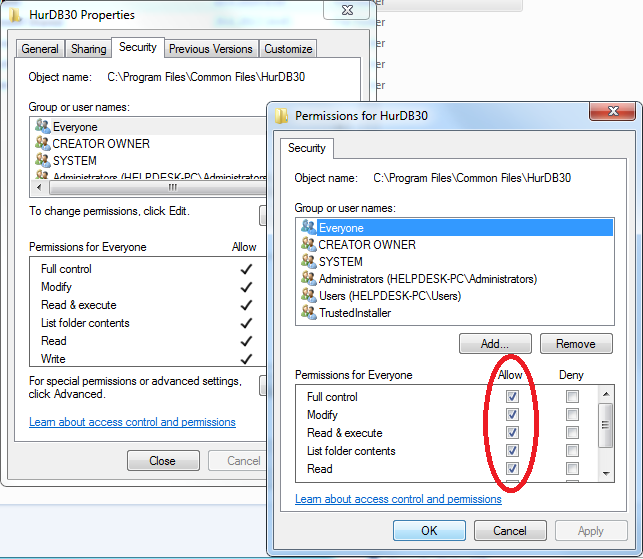 Allow every user full rights to the program folder and the database folder and to where the program folder is located. 18. How do I change a folder's user rights? You grant access to the folder by right-clicking on the folder and choose Properties -> Security-> click ”Edit…” -> ”Add…” and write ”Everyone” and press ”OK” Choose ”Everyone” from the list and click ”Full Control” then click ”OK”. 19. How do I export the test results? Right-click on a group and select " Export all results". 1. First download a PDF printer, for instance DOPDF. 2. Install the PDF-printersoftware and select the PDF-printer as default printer trough the Windows Control Panel. 4. Name the file according to your needs and select a location on your computer. You can then send the file for instance as an email attachement in your regular email client. 21. How do I move the database to another computer? If you want to transfer your test results to for instance a new computer, it is easily done by copying the HURDB30-database to a USB-s memory stick and then copy it to a new computer. 1. First, look for the database you have in use,its default location is C:\Program Files (x86)\Common Files\HurDB30\hur.s3db. You can also see in the software where it is. 2. Doubleclick with the left mouse button and the folder will open in a new window. 3. Copy the file hur.s3db to a USB-memorystick and transfer it to the other computer. 4. On the other computer, press the "Database"-button, and look for the file you copied. Download the guide "How to take backup of the database in iBalance SmartTouch"
22. How can multiple users access the same database and records? These instructions apply on the HUR Labs iBalance Premium software and the HUR Labs Body composition analyzer software. The databasehur.s3db is normally located under the c:\Program Files(x86)\Common Files\HURDB30-folder. This folder is defined per user if you don't have sufficient security settings set for all users. If you want multiple users on the same computer to have accessto this folder, you need to grant the users sufficient permissions. Another option is to place the database into a location where every user already has access. After that you need to select the database for every user inside the software, by pressing "Database"->"Change Database" and browse for the database on your computer, C:\Users\Public\Public documents\ and select the hur.s3db-file, this is the database where all users should save their results. Another way of solving this is to create a user account where all users have access, then you don't need to install the software but once to that particular user account. 23. How do I perform a test in the Balance software?